This is a housewarming gift for my brother and sister in law. They purchased an almost 150 year old house so I thought this would fit for them. The wood came from an old house I helped tear down and from an old airport hanger being dismantled close by where I live. The wood was old growth pine at least over one hundred years old. Love it. I would fill the cracks on a dining table but well done. I like that, it has character and an elegant design! Similar to this out of new lumber! Thanks a million guys. The cracks are filled with epoxy and black chalk Rick. Looking good Kaleb. Hope all is well with you and yours. You really did a nice job on this table. Very nice table, I find great joy in seeing such projects where wood is given a second life. The wood imperfections cracks and all give it a lot of character and makes it so unique. Great job. 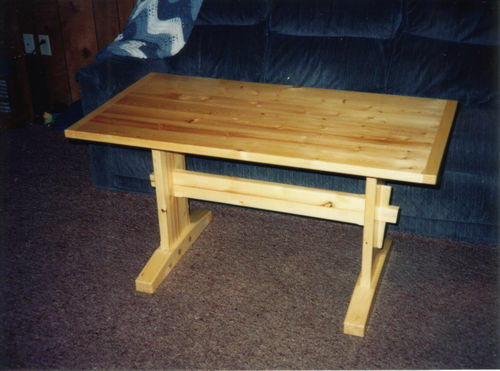 This is a beautiul table, really like the natural coloring through the middle and the wedged tenons.